A member of the Class of 1935 celebrates a milestone birthday this month. Before earning her business degree more than eight decades ago, Catherine Shaw Shors (35BSC) had to first pass a swim test, which was a requirement for graduation in those days. The many hours spent in the women's gymnasium pool at Halsey Hall would lead to a lifelong love of the water. FAMILY PHOTO COURTESY DAVE SHORS Catherine Shaw Shors, who turns 105 this month, is pictured with several of her great-grandchildren. The activity has certainly served her well. 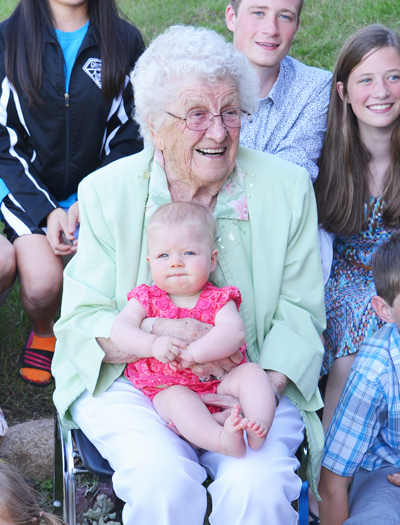 Shors turns 105 on May 20, making her one of the oldest living UI alumni, if not the oldest. While the university logs the date of birth of its 275,000 living alumni, deaths are not always reported to the university, making it difficult to determine if she's the standard-bearer for longevity. To put things in perspective, when Shors came to Iowa City in the early 1930s, Nile Kinnick (40BA) was still in junior high, future faculty member Grant Wood had just painted American Gothic, and the Iowa Memorial Union was a new campus hangout. Born in Pocahontas, Iowa, in 1913, Shors traveled by train to the UI, where she studied in the College of Commerce and lived in Currier Hall, the all-women's dorm. A standout student, Shors served as vice president of the Iowa chapter of Beta Gamma Sigma, a national honorary scholarship fraternity for those ranking in the top 10 percent of their senior class, and treasurer for Mortar Board, a senior honorary society for women. Shors, who recalls being just one of two women to graduate in her business class of about 50, worked nearly full time in college as a typist during the Great Depression. "I didn't have much time for fun," recalls Shors. "I was either in class or working every day from eight to five. Then I'd do my studying at night." After graduation, Shors worked as a secretary in her father's law office and then for many years as a legal assistant for her husband, George, with whom she raised four children. Today, the lifelong Pocahontas resident's family tree has grown to include 10 grandchildren and 23 great-grandchildren. Shors' family ties to the UI date even further back than her days on campus. Her grandfather, William F. Murphy (1880LLB), was an early graduate of the UI College of Law and a longtime Iowa City lawyer. Two of Shors' sons also studied law at the UI—John Shors (64JD) and the late Richard Shors (66LLB). Shors credits an active lifestyle for her good health. She was an avid walker and swam at her summer cottage on Lake Okoboji until her late 90s. These days, she's known at her retirement community in Pocahontas as a voracious reader and resident bridge expert. A few years ago, John Shors called the university to inquire about his mother's latest reunion year—it would have been her 80th—and asked if the UI was in touch with any others from the class of 1935. The woman on the other end of the phone was amazed. "The alumni office said, 'Absolutely not,'" John laughs.